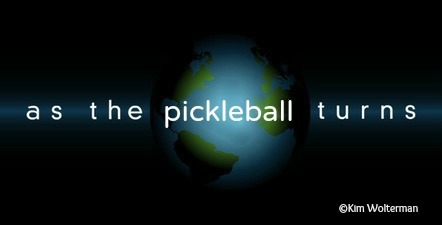 Who knew that there could be so much daytime drama at recreational pickleball games? Sure, it's been called the fastest growing sport in America, so lots of folks are playing it. But let's be honest here. As a game that combines components of tennis, badminton and pingpong, its low-impact nature attracts the over-sixty crowd, especially for games that take place during weekdays. 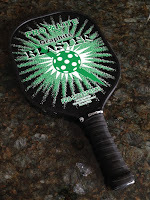 While playing at a local facility last week, an older man came to try his hand at pickleball for the first time. He was accompanied by his son, who had played with us for the first time the previous week. Right away I could tell it was the man's first time. Attired in a polo shirt nicely tucked into his belted blue jeans, he was not dressed for the game. He also had on a pair of tennis shoes more suited to walking outdoors than quick movement on a wooden basketball floor. Most of the pickleball falls are due to wearing incorrect shoes. Another woman and I played the first game with the two of them to get the dad acquainted with the rules and scoring. We had a good time. After that "dad" played with other partners as players rotated on and off the three courts. The son and I had just come off a court when all of a sudden there was a huge bang - not once, but twice. I turned to look for the noise and I saw that "dad" was down on the floor clutching his head. He had run backwards for a ball and smacked into the wall before hitting the ground. The impact cut his head open, and he was bleeding quite profusely. I went over to grab the son to tell him his dad was hurt, and someone else dashed out the door to get towels and advise the staff of the recreation center. Emergency responders were called, so the rest of us cleared to one side of the gym to wait. He was evaluated and taken away by ambulance. I'm sure they wanted to make sure he didn't have a concussion. After 30 minutes, play resumed on the courts. We have not heard how "dad" is doing. I'm not sure either he or his son will return. At the same facility this week, there was almost a brawl between two men. Over a woman, no less. I had never seen any of the three stars of this drama before. I'll call the first man D and the other two Mr. and Mrs. I had played a game with D earlier in the session, and found him to be very aggressive and a bit of a ball hog. Whatever...As I tell everyone, I play for fun and fitness so I tend not to take the game too seriously. Don't get me wrong, I try to play the best I can and it's always great to win, but it is no skin off my nose if my side loses. Anyway, D found himself on a team with Mrs., and Mr. was sitting on the bleachers next to their court waiting for his turn to play. Apparently D did not like the way Mrs. was playing, and kept telling her to get up to the front line. He was correct, but the Mrs. did not like him telling her what to do. Finally, they got into it a little, and she asked someone from the bleachers to come in for her. Mrs. then walked out. That's when Mr. got up in the face of D and told him off. We could hear the yelling all the way down on our court at the other end of the gym. Mr. told D he needed to apologize to Mrs., and D said that he already had. Whether that is true or not, I don't know. But the yelling continued, and Mrs. finally came back in and dragged Mr. out of there. I doubt they will return either. 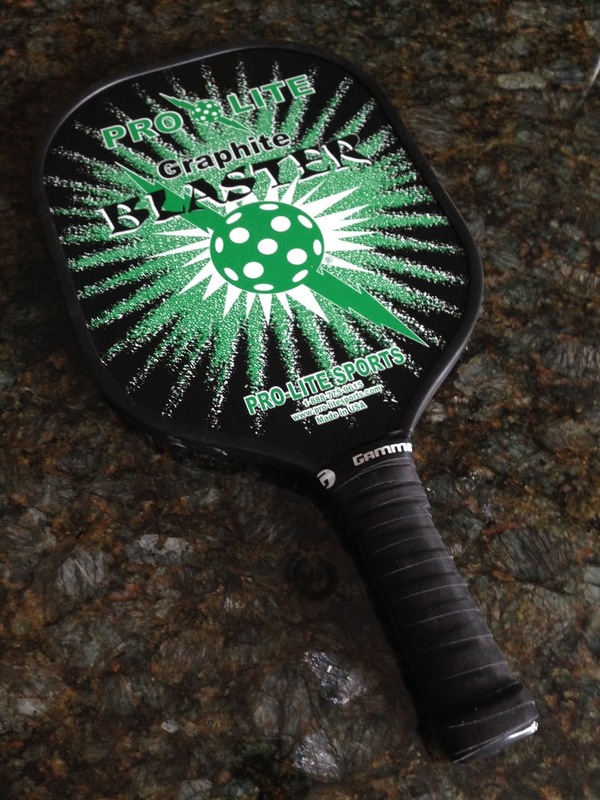 I have seen one other tense situation, and it happened at my home pickleball facility. Two men that I'll refer to as C and B were playing together for the first time, though they both have played pickleball for quite awhile. C kept telling B what he was doing wrong. B finally had enough, and told C to quit telling him what to do. C walked off the court, packed up his toys and went home. He has never come back to that facility, though I play with him on Fridays at a different location. Basically C just expects you to get everything that isn't hit directly to him. You might as well be playing a singles game. But now that I know what to expect, I don't mind having him as a partner. A number of people won't play with him. Really, folks - it's just a game. Who needs daytime soaps? Come to the pickleball courts! 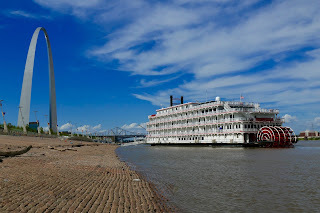 Last week the Queen of the Mississippi riverboat docked along the riverfront in St. Louis for a few days. Built in 2015 to carry 150 passengers this paddlewheeler offers various cruises up and down the Mississippi River. My friend and I went downtown Friday afternoon to take some photographs of the boat before its Saturday morning departure. 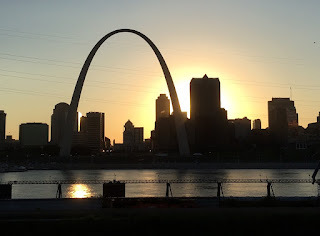 I have to say that the designer did a wonderful job of replicating the look and feel of the old riverboats that used to grace the landing of St. Louis. It was my first time getting a close up look at all the work that is going on around the Arch. 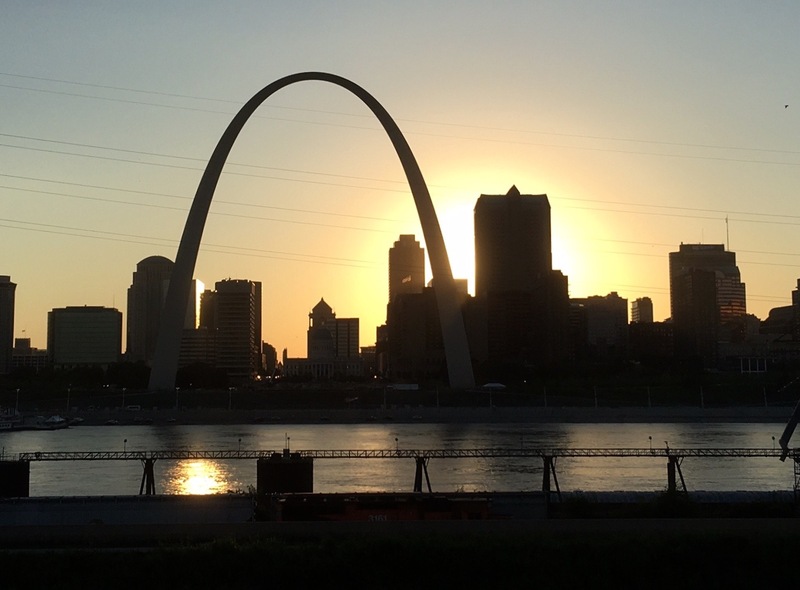 The project was supposed to be finished by October 28, 2015, the 50th anniversary of the Arch completion. Whoops! It is still quite a mess in the area, but I'm sure it will be great once it's all done. 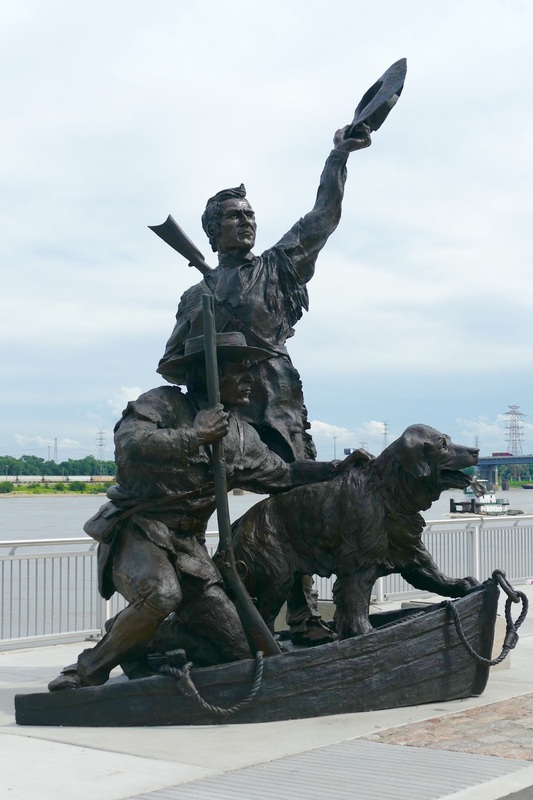 The new bike/walking lanes along the riverfront are nice, and there is now an impressive sculpture commemorating the return of the Lewis and Clark expedition on September 23, 1806. The dog seems to be a little out of scale, or perhaps they took an English mastiff along for the ride. 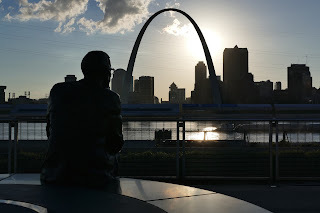 I was happy to see so many people out and about enjoying the riverfront area, especially as there was a warning from Scott Air Force Base that a demonstration was supposed to take place at the Arch at 6:00 that day. We saw no signs of any trouble however. Following dinner outside at one of the restaurants on the landing, we made our way across the Martin Luther King bridge to East St. Louis, Illinois. The Malcolm W. Martin Memorial Park offers some of the best views of the St. Louis skyline. I have been hoping to capture some sunset pictures, and wanted to go when I had another person with me. The area is a little remote, and we were the only two people there for awhile. When a car pulled in with two guys in it, we decided it was time to take off. Next time we will go with a group, as we felt too vulnerable. It was fun while it lasted though! Sunday Jim and I relaxed at a friend's lake house. Located about 45 minutes from our house, it is an easy getaway. Our friends are out of town, so it was just the three of us. (We can't go without Kirby - he loves it there!) We packed a lunch and spent the day swimming and going out on the boat. What a great way to end the week. Jim's aunt and uncle, along with one of their daughters, visited us over the weekend. They had a long drive from Minnesota, and arrived on Sunday. Normally when we have visitors they come on Friday or Saturday, so having an extra day to prepare the house was unusual for us. We were all ready for them by just after noon, with the dessert made and in the freezer, the salad and lasagna all put together, and I even had my overnight breakfast casserole for Monday morning prepared and waiting in the downstairs refrigerator. Since we were ready so early, I kept thinking we had missed something. But no, we were just extremely organized for a change. Monday following breakfast and clean up, we headed downtown for the Cardinals baseball game. 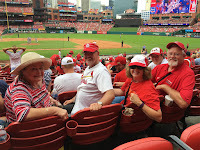 Jim and I were sorry to miss the Webster Groves July 4th parade as it is always quite good, but we needed to go to the game early to grab a good parking spot for the elderly relatives, and so that we could watch batting practice. Best laid plans... It began to rain and the field was covered by a tarp. Warm-up took place downstairs out of sight. The 1:15 game was delayed first to 1:45 and then to 2:30. I enjoy going to the games, but they are certainly long enough without adding a late start to the equation. As it ended up, we would have had plenty of time to enjoy the parade and still make it downtown in time for the delayed game start time. Oh well. It was a competitive game, though the Cardinals did not win. We had a nice time anyway. As we didn't get home until nearly 6:30, it was a good thing that I had thrown a roast into the crockpot before we left. It didn't take too long to put the rest of dinner together. We talked about walking down to the end of our street to watch the fireworks, but everyone was pretty tired. That ended up to be fortuitous, because they had a mishap with our municipal fireworks display. Normally on the 4th the fireworks show is around 20 minutes long. I was standing on our front porch to catch a little glimpse of them, and all of a sudden the noise and sounds were deafening! The whole show lasted about 6 minutes. There was a lot of chatter about the abbreviated show on our local Facebook page, and I was eager to hear what the "official" word would be. It turns out that one of the ground displays got away from them and lit the finale display. Boom! There was no way for the operators to stop it at that point. So I guess it was premature ignitulation - ha! After breakfast Tuesday morning, our company packed up to head home, and Jim took off for work. I tackled the dishes, four loads of sheets and towels, and put the guest bedrooms back in order. The party was officially over. 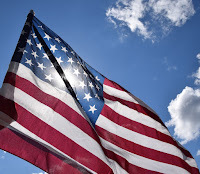 One blog post in June - that is pathetic! 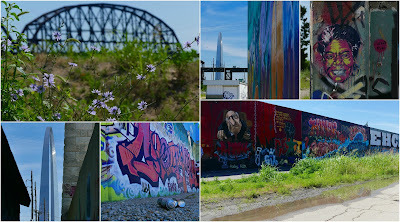 I should have posted before now, but I had a great time with my sister shooters taking pictures of the graffiti wall downtown. 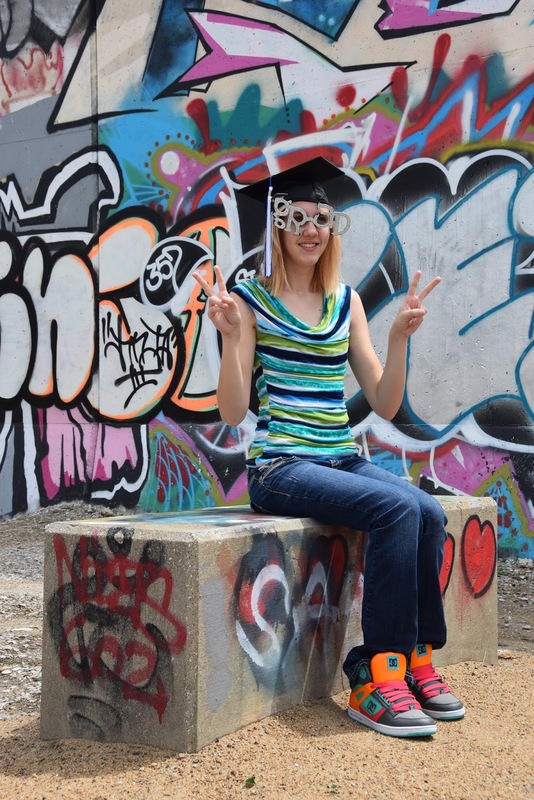 I hadn't been down there since I photographed my great-niece for her high school graduation. It's hard to believe that was two years ago already. They have really cleaned up the area near where the wall begins. That bike trail tax we all voted for sure does come in handy. You never know where it will pop up. At any rate, while the day was bright and a little warm, it was still fun to be out with like-minded women. A few of us went out for lunch after taking the pictures. Here are a few of my favorite photos from the day. Last weekend we attended an open house for a presbyterian church in Kirkwood. 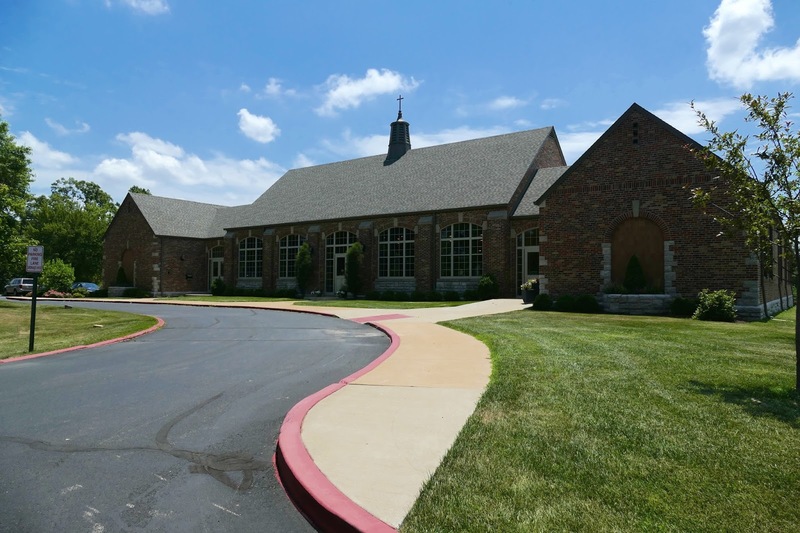 The congregation took an old school building that is located in the historic area of Meramec Highlands and repurposed it as their church. Our interest in the renovation lies in the fact that the school had once been owned by St. Joseph Hospital to house their child care center. 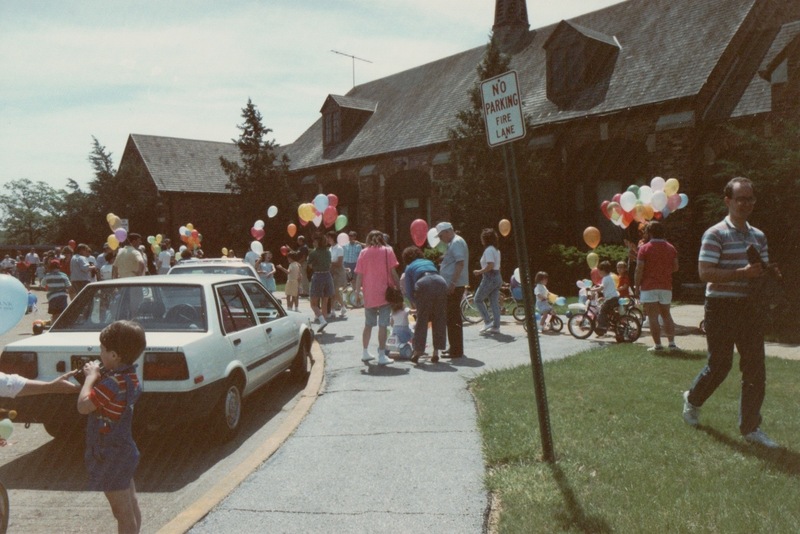 The center was open to non-employees of the hospital as well, and our son went there from 1987 until he began kindergarten in the fall of 1990. It was amazing to see the pictures of the mess the church started with when they bought the property, and the transformation into what it has become. It is truly a great re-use of an old school. It was fun for us to walk through the school and see the rooms our little guy once played in. A gal on the Facebook page of my community posted that she had more plums on her tree than she could possibly eat, so she offered them up to anyone who wanted some. 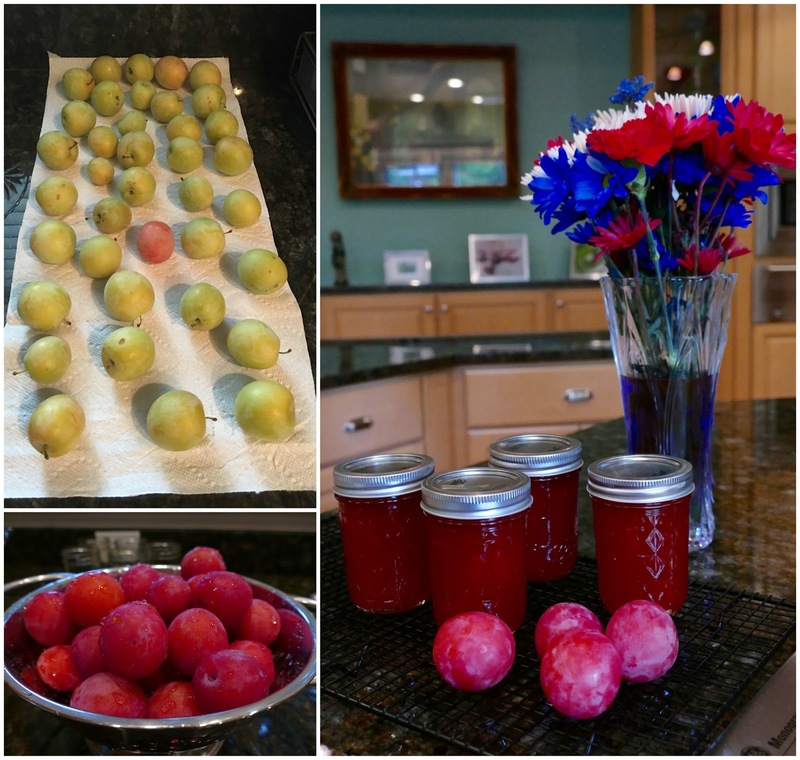 I had never tried to make plum jam, and thought this would be the perfect time to try my hand at it. Not wanting to seem greedy since I needed quite a few to make a batch, I asked her if she wanted a jar of my finished product in exchange for the plums. She knew that I had also made some blackberry/raspberry jam recently, so she eagerly offered a trade for a jar of that instead. I'm thinking she was probably pretty tired of plum anything by that point. The exchange was made, and I had to wait a few days for the plums to ripen. Personally, I wasn't a fan of the flavor of these plums, so I was unsure what the jam would end up tasting like. At the end, I was pleasantly surprised. The plum jam has just the right combination of sweet-tart taste. However, plums are way more labor intense than any other fruit I have tried so far. I won't be rushing out to make more anytime soon. Having quite a few jam sessions (har, har!) under my belt now, it is a mystery to me how anyone makes money selling homemade jams and jellies at markets. 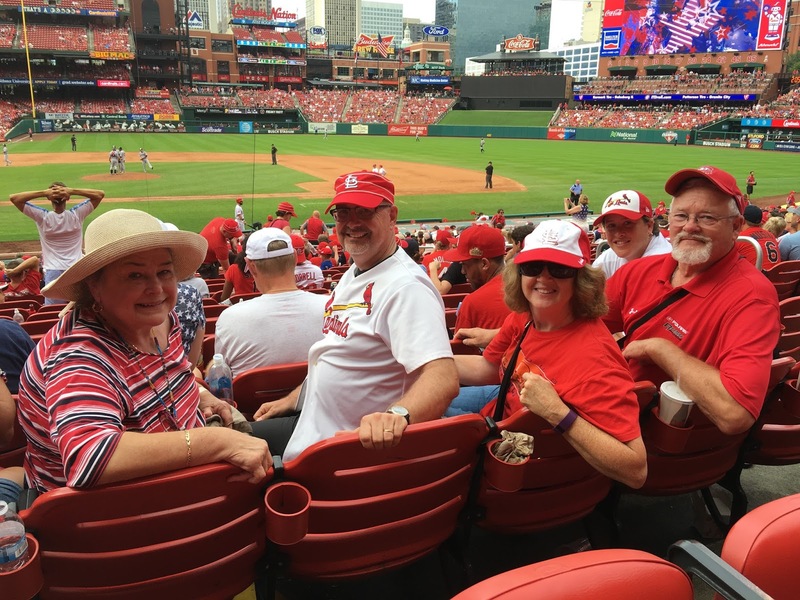 Tomorrow Jim's aunt, uncle and cousin are coming from Minnesota for a visit and to attend a Cardinals game. 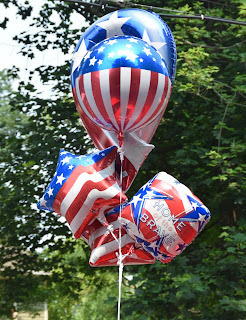 It will be fun to show them our little Americana town in all of its 4th of July finery. Happy 4th, everyone!